A yaysama (or yayshama) is literally a song of "one's side", a song about the self. Apparently it is possible to sing someone else's yaysama; here's Toko Emi singing one about her grandmother's grandmother. Tonkori and mukkuri are instruments, strongly identified with Ainu culture as they have no counterpart in Japanese music. On the other hand, the word I have translated "break," ai no te, is used in Japanese art music. It refers to a short instrumental interlude, usually connecting two lines of the lyric. The unseen Ainu musicians of the poem are implicitly put on the same level as the shamisen-and-koto musicians down south. Uppopo-po-po is harder to figure out. Upopo is a word for a type of song, apparently a canon sung by people (usually women) sitting in a circle. It doesn't seem to have much overlap with yaysama. On the other hand the addition of the extra po-po suggests that maybe Unkai is using it for a sort of semi-onomatopoeic effect: the sound of Ainu music, if you will. The Japanese word yutanpo basically means "hot water bottle." The original referent was one of the many Chinese conveniences imported during the Muromachi period (see also kotatsu): a sealable stoneware or metal container, normally shaped something like a gourd but occasionally fancier, which was filled with hot water and placed in the bedding. Today, the meaning of yutanpo has expanded to include European-style hot water bottles as well. What interests me about the yutanpo is the word itself. The commonly accepted kanji are 湯湯婆: "hot water" + "hot water" + "old lady". The "old lady" thing is apparently a sort of euphemism for "wife," referring to the fact that it keeps you warm in bed. (I have no reliable source for this, but it makes sense.) Pronouncing the character 湯 /tan/ is a bit unusual in Japanese; this is because it's a tō-on 唐音 or "Tang pronunciation". The more common pronunciation of 湯, tō, is the kan-on 漢音 "Han pronunciation." There are other cases where 湯 is pronounced /tan/, though, such as tanmen 湯麺 — although here, as Sugimoto Tsutomu points out in Gogenkai 語源海, the 湯 has the more historically recent meaning of "soup" rather than "hot water." So that leaves us with the question of why 湯 "hot water" appears in this word two times, first representing a Japanese morpheme and next a Sino-Japanese one. Sugimoto's explanation, which basically tallies with other sources I checked, is that originally there was no initial yu-. The word was just tanpo (and it was written in other ways, too: 脚婆 ["leg old-lady"], 湯媼 ["hot-water old-lady-spelt-differently"], etc.) It also appears as <Tampo> in the Nippo Jisho . The yu was added in the 17th century or later, most likely because at some point it was no longer sufficiently obvious that tan meant "hot water" to enough of the people using the word. Sort of a similar process to the one in English that gives us "ATM machine" and "PIN number," or perhaps closer to "please RSVP" or (in French) "le protocole IP" [he said, reading Wikipedia]. That's one of those newfangled yutanpo that Hirao sell in Bakuro-chō. The tōro [long wooden hibachi] is burning and the room is warmed up. The tanpo has just been changed. Maybe if they hadn't been so busy coining words for "freedom" and "society" in the Meiji period, they would have had time to remember what the words they already had actually meant. [Famed 3rd-century mystic] Guan Lu 管輅 arrived at a field and saw that Zhao Yang 顏超's features indicated an early death. Zhao Yang's father begged Guan Lu to extend his son's allotted span. "Go home and buy wine and venison," Guan Lu said. "On the Day of the Rabbit, under the big mulberry tree south of the harvested barley fields, you will see two men sitting at a go board. Pour the wine and serve the venison. Whenever one of them finishes one cup, pour another, until the wine's all gone. If they ask you anything, only bow your head, and do not speak. Do this and they will surely save you." Zhao Yang did as he was told, and sure enough found two men there sitting at a go board. He placed venison and wine before them. Engrossed in their game, they drank the wine and ate the venison without acknowledging Zhao Yang himself. After a time, the man sitting to the north looked up at Zhao Yang. "Why are you here?" he demanded angrily. Zhao Yang simply bowed his head. "We have been drinking his wine and eating his venison for some time now," said the man sitting to the south. "Do we not owe him something?" "The text is already decided," said the man to the north. "Let me see the page," said the man to the south. Seeing that Zhao Yang's life was to end at the age of 19 (十九), he took a brush and added the mark indicating that two characters are to be reversed. "You are saved," he said to Zhao Yang. "You will live to the age of 90 (九十)." Zhao Yang bowed and left. Later, Guan Lu explained to him: "I am glad to have helped you in this joyous achievement. The man sitting to the north was the Big Dipper, and the man sitting to the south was the Southern Dipper. The Southern Dipper pours life into all, while the Big Dipper is lord of death. All people start at the Southern Dipper when they receive life and move inexorably north to the Big Dipper. That is why when we pray, we direct it at the Big Dipper." Always be nice to your editors. Note: Guan Lu actually has a Wikipedia entry, but its translation of this story is either a poor one or a different text, and the punchline of the story, i.e. the fact that the Southern Dipper adds an editor's mark to 十九 (19) to indicate that it should be 九十 (90), is garbled. The idea seems to be turning 十 into 九 (so, 19 → 99) instead, but even that is very poorly explained. The Wikipedia version also appends some nonsense about What Hath Divination Wrought, interpolates unnecessary weeping, etc. It's like a Guan Lu Smallville . 訳主 ("Lead Translator"): Read the Sanskrit original aloud. Devasanti performed this task. 証義 ("Meaning Certifier"): Sat to the left of the Lead Translator and discussed the meaning of the Sanskrit original. 証文 ("Text Certifier"): Sat to the right of the Lead Translator and confirmed that the text had been read aloud without error. 筆受 ("Receiver via Brush"): Translated the Sanskrit written in Chinese characters into Chinese. For example, 紇哩第野 would become 心, and 素怛羅 would become 経, combining to form 心経, "Heart Sutra." 綴文 ("Text Composer"): Rearranged the individually translated words into the correct Chinese word order; which is to say, into kanbun. 参訳 ("Translation Barger-into"): Checked the translated text against the original Sanskrit, and corrected any errors. 刊定 ("Trimmer/Finalizer"): Edited cumbersome or long-winded expressions down to size. Sanskrit texts had a tendency to be detailed and lengthy, but in Chinese texts brevity was prized. 潤文官 ("Text-Juicing Official"): Determined whether the translation was appropriate as Chinese text, and added rhetorical flourish as necessary. For example, the "度一切苦厄" ("he crossed beyond all suffering and difficulty") of "照見五蘊皆空 度一切苦厄" ("he illuminated the five skandhas and saw that they were all empty, and he crossed beyond all suffering and difficulty") was not in the original; it was added at this stage. The previous eight steps were performed by monks, but this step was performed by a lay official. Anyway, Kin notes that not every translation into Chinese of a Buddhist sutra was done in such an elaborate way, and indeed the above has no small element of ritual to it over and above what is necessary to get a translation done. Still, the basic division of labor seems to have been pretty common, in particular the dictate/transcribe/translate/trim/touch-up cycle. Crimes against property are rare in Japan, which is owing to the high-spirited and honourable feelings that actuate all classes of the community; but from the feudal nature of the government, the small value attached to life, and the deadly weapons constantly carried, by the military classes, who are notoriously proud and revengeful, crimes against the person are very frequent. A great check upon criminal offences is the severity of the punishments inflicted, and the disgrace entailed upon the culprit's family. Although the laws are extremely severe, and in their administration there is neither jury nor counsel, justice is delivered with great impartiality; and the judge, who is generally the governor of the town or district in which the offence has been committed, is entrusted with considerable discretionary power. When a prisoner is being examined his arms are bound to his sides by a rope, which also passes round his neck, the end of which is held by an official, who, if his charge prove unruly, manages him by pulls and jerks. 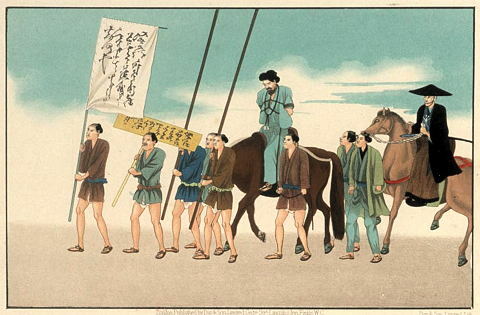 'Thrashemono,' or 'public exposure,' is associated with all Japanese punishments, and is said to be in itself a great preventive of crime, as the spirited Japanese dread being held up to the reprobation of their acquaintance more than they fear the extreme penalty of the law. Thrashemono! Now there's a word I wish had made it into English. Maybe someone can persuade John Zorn to use it in an upcoming project. The illustration, showing the mode of conducting a criminal to execution, is an instance of 'thrashemono.' The culprit is bound on a horse, and is preceded by a placard, borne by his relatives or neighbours, and indicating his crime. In this manner he is conducted through the town to the place of execution, where his sentence is read to him. He is then placed (with his limbs still bound) over a freshly-dug hole, where he is supported by his relatives till the executioner's sword performs its task. After execution, the heads of malefactors are generally exposed: that of Simono Sedgi [Shimizu Seiji, more commonly pronounced Shimizu Kiyotsugu 清水清次] (the lonin [sic!] who was decapitated in the presence of the British garrison of Yokohama, for being the organizer of the assassination of Major Baldwin and Lieutenant Bird of Her Majesty's 20th Regiment) was exhibited on the public stand at the guard-house at the entrance of the town. This man was a fair specimen of the lonin type, and was a most determined ruffian, whose whole life had been a career of crime. There would be a national holiday in this guy's honor if he'd been Australian.